Moving entails more than just packing and moving goods. To be honest, it is a complex job which includes numerous individual tasks. While many may believe it to be a DIY job, in reality, it requires matchless skill and competence and is best executed by professionals. 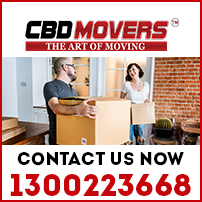 At CBD Movers™, we are the finest movers in Melbourne. Equipped with the latest tools and vehicles, we are armed by the best person to carry out the job. Our wide range of removal services help you plan, pack and move effortlessly. At CBD Movers, we take pride in being the safest professional movers in Melbourne. We well recognize the client’s requirement and offer bespoke services to cater to varied needs and budget. We undertake a vast spectrum of services. Our ‘Movers & Packers’ deal is apt for comprehensive shifting of office and house set-ups. We also offer ‘Two men &Truck’ services to shift fragile articles, heavy furniture or machinery swiftly. Our services are not bounded within the state or national borders. We hold the necessary licenses to undertake local, national as well as international removals without legal hassles. We excel in packing and use sophisticated packing materials for maximum protection. Our fleet of trucks is well equipped with the latest moving gear and ensures maximum safety during transit. 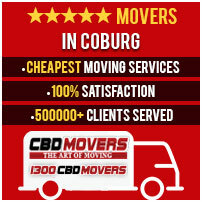 At CBD Movers, we are amongst the most proficient and affordable removals in Melbourne. Our policy to slash every written quote by 10% makes us the cheapest removalists in Melbourne. We also offer comprehensive transit insurance for additional safety of the goods. All our operations are transparent without any hidden extras. Coburg, one of the oldest suburbs of Melbourne, is well known for its heritage, culture, and diversity. Packed with all the amenities of the 21st century, Coburg offers comfortable living to nearly 25,000 people. Beautiful houses, office spaces, shopping malls, sports complex, art galleries, cafes, eateries, pubs and much more, Coburg offers everything. At CBD Movers, we extend our support and services to undertake all types of relocation jobs in this beautiful suburb. Our superior services are priced at the most affordable rates. Call us at 1300 223 668 for a free quote or to inquire more about our services.